Cathays Park in Cardiff originated as the private park of the first Marquis of Bute, who in 1812 built a mansion (Cathays House) there, on the site of an earlier house for which records go back to the seventeenth century. Cathays House was built at a cost of £40,000 but was subsequently demolished by the second Marquis in 1814. The park land was preserved and comprised a walled area whose western and eastern boundaries were respectively the present North Road and Park Place, while the present Corbett Road formed the northerly boundary and the Friary estate the southerly. Improvements during the nineteenth century included the construction of drive ways along the west and south sides, and the planting of an elm avenue from north to south boundary, still reflected in the present Edward VII Avenue. In the 1850s Dobbin Pits Farm occupied the northerly part of the Park, with a nursery on the eastern side - originally the kitchen garden for Cathays House - where the present Cardiff University Main Building stands. According to the 1851 Ordnance Survey plan of Cardiff, the southerly part of the present-day Park Place existed and was called Dobbins Road. It was also known as Dobbinpits Road, described as the Blind Lane leading from Crockherbtown (the old name for Queen Street) to Dobbinpits. In 1887, at the same time as negotiations were taking place to obtain land for Roath Park, the Council requested the third Marquis of Bute to allow Cathays Park to be made available to the public for recreation, especially in the summer months, though apparently nothing came of this. 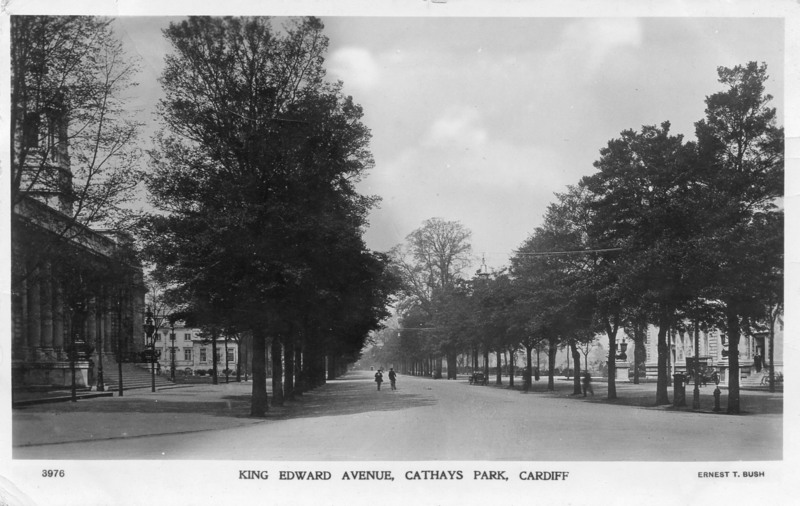 The Council first approached Lord Bute in the 1890s with a view to purchasing the whole of Cathays Park, not only from the desire to provide recreational space, but also because of the need for a location for a new Town Hall. The proposal for Cathays Park was to create new public buildings around a central open space which would be retained as a park. Negotiations began in 1892, and Lord Bute was willing to sell 38 acres for £120,000, but there was opposition both within the Council and from prominent members of the public, because the price was considered too high, and Cathays Park was thought to be not central enough as a location for Council offices. 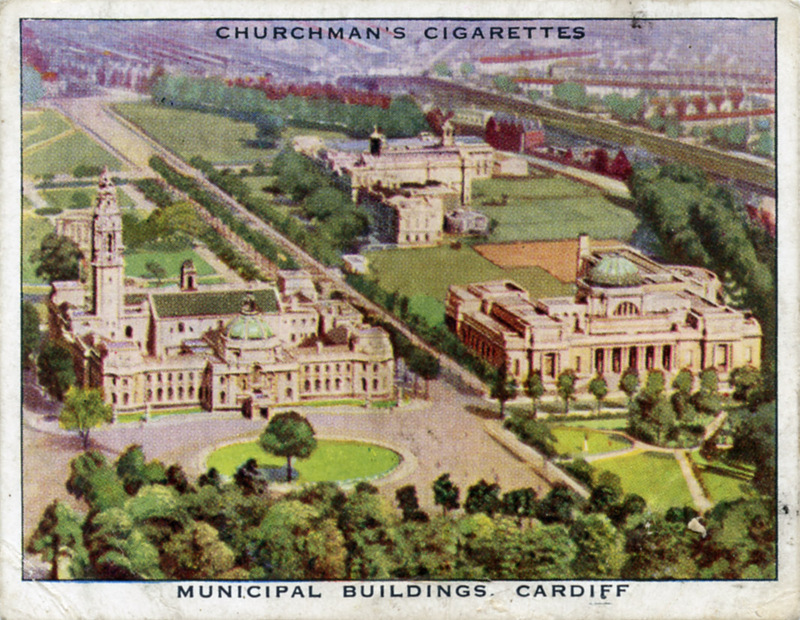 No progress was made over the next four years, and alternative sites were suggested for a new Town Hall, but the Cathays Park proposal was revived in 1896 when the University authorities made it known that they were seeking a site for a new and prestigious building. The Council eventually purchased an area of 59 acres from Lord Bute, at a total cost of £161,000. Part of the Friary lands was excluded from the sale, as was the one-acre plot at the north west corner of the park which was the site of Cathays House. The relic of the mansion's ice house still existed in the 1890s as a turf-covered mound, and was probably the reason why Lord Bute excluded the one acre from the sale. It was acquired by the Council much later and is now the site of the University Redwood Building. Lord Bute also made it a condition of the sale that certain trees be preserved (such as the elm avenue), that the triangular plot which was to become Friary Gardens should never be built on, and that the northern bank of the dock feeder canal was to be planted with trees and enclosed. An Act of Parliament was needed for the sale to take place and the Cardiff Corporation Act received royal assent on 25th July 1898. The purchase was completed at the end of the year, on the 14th December when a ceremony was arranged for the handing over of the keys to the Park. Another ceremony took place in March 1899 to mark the opening of the Park to the public as a recreation ground, but this was only temporary because plans were already in progress for new public buildings and formal gardens. The Borough Engineer's plan for the laying out of the park had been in existence since 1889, and it included the sites of the Town (later City) Hall and Law Courts, the Museum, the Technical College and University College just as they were eventually built. Edward VII Avenue, incorporating Lord Bute's elm avenue, was officially opened by the King in July 1907. The development of the open spaces did not follow the original plan. Work began in 1903 with the planting of University Gardens, later renamed Alexandra Gardens in honour of Queen Alexandra, and formally opened in July 1910. Friary Gardens and Gorsedd Gardens followed, beginning in 1904-5 and completed in 1910. Plans for the buildings and road lay-out proceeded in parallel, the roads being completed by 1909. There was a circular lawn immediately in front of City Hall and this was fenced with granite posts and chains in the autumn of 1912. 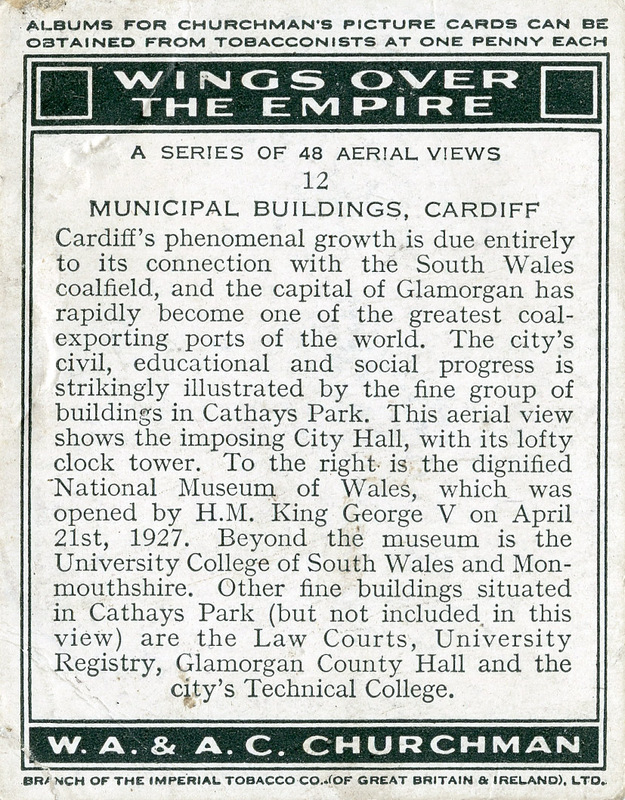 Cathays Park was the destination for Ernest Willows' flights across Cardiff in his airship in June 1910. His first flight on a Saturday morning left Splott Park at 06.50 and arrived at City Hall seven minutes later, flying at 300 feet. After landing in Cathays Park on the open space near the Tredegar statue and remaining there for half an hour, Willows returned to Splott. The following Tuesday evening Willows made another flight over the city. His course took him over the Infirmary, along Newport Road and Queen Street, then over the Castle, to land in Cathays Park in front of the University College. While flying above Queen Street Willows dropped a letter addressed to the editor of the South Wales Daily News, announcing his successful flight and claiming the prize which had been offered for the first airman to fly across the city. The modern Cathays Park is synonymous with Cardiff's Civic Centre, comprising the City Hall, Law Courts, National Museum, Cardiff University, University of Wales Registry, Welsh Assembly Government (formerly the Welsh Office and Welsh Board of Health), Temple of Peace and Health and other public buildings, built around the original three Gardens. These contain several important statues and memorials, more details of which may be found in the sections dealing with specific the gardens, and in the National Monuments Record of Wales - Cathays Park. At the south end of Edward VII Avenue, between the Law Courts and City Hall, is the South African War Memorial, a bronze sculpture erected in 1908. In general, the information in this section is taken from A. A. Pettigrew, The Public Parks and Recreation Grounds of Cardiff, Volumes 2 & 5.